Jamie Harrington approached the stranger on the ledge of a bridge and asked ‘Are you okay?’. A YOUNG MAN who helped a stranger down from the ledge of a Dublin bridge is now being thanked in a very special way. 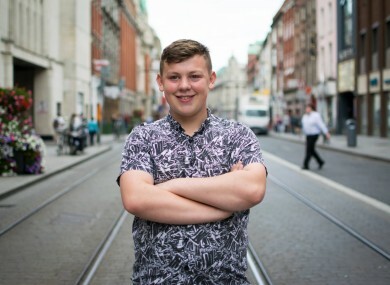 Jamie Harrington’s story has been shared his story on the Humans of Dublin Facebook page. The page, created by photographer Peter Varga, is inspired by the hugely popular Humans of New York. Varga takes photos of Dubliners from all walks and talks to them about their lives. “I was just on my way to the American sweet shop to buy some Gatorade, when I saw this guy in his 30s sitting on the ledge of the bridge. I just thought, “wow…” I stopped and asked him if he was okay, but I knew from the look in his eyes he wasn’t, and he didn’t say anything either, but I saw tears coming from his eyes. “I pleaded with him for a while to come down and sit on the steps, and eventually he did. “We sat on the sidewalk on the south side of the Liffey and talked for about 45 minutes, about what was happening to him, why was he feeling that way… I couldn’t leave him there alone, but I had to go, so I was going to ring an ambulance. “I told him they could help him feel better. But he was like “please, please don’t call them, I’m fine, I just want to walk around for a while, I’m gonna be okay!” I told him to please let me ring an ambulance, that I wouldn’t sleep knowing he was just walking around alone. So I rang it, and he was taken to St. James Hospital. I got his number so I would know what was going on with him for a good while… And about three months ago, he texted me that his wife is pregnant, they’re having a boy, and they’re naming him after me. Can you believe that? They’re going to name their child after me. Email “This Irish teen saved a man from taking his own life - and had a baby named after him”. Feedback on “This Irish teen saved a man from taking his own life - and had a baby named after him”.